Knitting. It kept me sane in the insane world of cancer. I could get lost for hours in the hypnotic rhythm of the repetition of a stockinette stitch. Laying out a complex lace pattern on a spreadsheet would challenge me to the point of complete distraction. I never went anywhere without my project pouch. 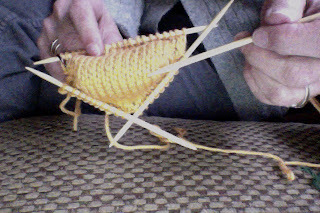 I would knit in the car (of course I wasn't driving, silly). I'd knit in doctor's offices and chemo waiting rooms. I wrote about that here. 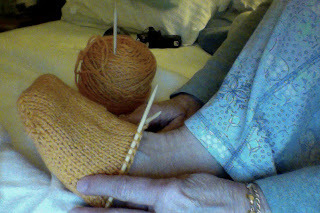 I would knit while sitting by my mother's bed and my son's chair. I would knit at bowling and told about that here. I would always be on the lookout for a new yarn store. I would get suckered in every time I walked into a new LYS, and I wrote about it here. I bought lots of yarn and then bought some more. There is a wing in my closet, (okay maybe a corner) devoted to yarn. Big plastic containers with sheep and alpaca yarn for scarves and sweaters. Sock yarn, for mainly socks but sometimes shawls. Baby yarn for baby things. Acrylic yarn for afghans. Book shelves for books on, yep knitting. I rearranged my living room so that I could have a knitting corner. Find that story here. When that wasn't enough, I renovated our only spare bedroom and turned it into a knitting room. When my mother passed away, I kept knitting. I knit christmas stocking hats for all of the kids and scarves for the big kids. I was a proud one of now 2 million members of Ravelry. But then my son passed away and I started to lose interest in knitting. I no longer had an uncontrollable desire to ogle the purples and reds or squish the yarn puffs in Woolbearers. My obsession was waning. I tried to cheer myself up by knitting a marigold scarf. But I was too sad. I feared that knitting could not keep me sane in the insane world of grief. As I sat in my knitting corner of my living room today, crying and not knitting, I realized how much I missed the feel of the needles in my hands and the yarn passing through my fingers. So I wiped the tears from my eyes, blew my nose, and ventured into the knitting wing corner of my closet where I found some left over marigold yarn. 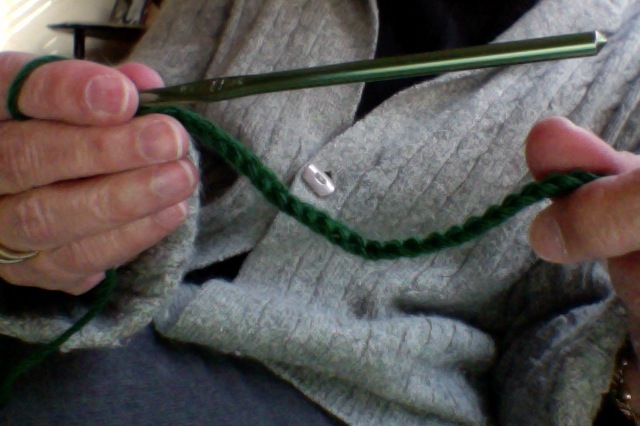 I figured I needed something more challenging than a garter stitch scarf. I had knitted socks but never learned the toe up method. I googled and found Very Pink. I bought a sock pattern from her web site which comes complete with tutorial videos. And I found myself lost in the challenge of this new technique. You have to use a scrap yarn of a different color than the sock. I have quite a ways to go before I can wear my marigold sock. And then I have to make another one just like it. I'm still sad, but I forgot for a little while as I knit in the round, around and around. Slim home from college. Drove me to bank on business. Brought baby to see live bunnies and chicks in Kresge Dep. Store and Bambs. Supper at 360. home early and bed. I still love the color of that yarn. It will make lovely socks and I hope you will share a photo of the finished product. I am sorry for your sadness, but glad you have this outlet and hope your yarn and needles ease things a bit. I'm so happy that the knitting is helping a little. Sounds like you have quite a stash to get through. Once I started my project, I was surprised at how easy it was to get back into the rhythm. It was a calming feeling. I know what you mean about feeling guilty about taking a break from the grief. But perhaps it's not so much guilt but a feeling that I would be letting go, not of the grief, but letting go of Joe. Awesome. I'm glad you're knitting! I always found that if I could get a project going, it helped to relieve the pain for the time that I was lost in concentration and participation. It's nice to have a break from the grief! But sometimes I would feel guilty about that too. I have a friend that knits socks! She bought patterned yarn, so that her socks had stripes. You got alot done today! Yes, Hope you have enought Marigold for the second sock! I wish I had time to go and read your other stories, but can't tonight. Headed to the bed! Grief is a terrible thing. I can't imagine losing one of my kids. It was hard enough losing my parents. I enjoy crochet a lot more because I am more proficient at it. I can knit, but I get a little stressed when I tend to drop stitches. If knitting helps you cope, by all means knit. I would play piano for hours on end when my mom died, and it did help. Time helps the most. So sorry for your loss, my prayers and thoughts are with you!! I can't imagine the pain that comes with the loss of a child. I do hope that you can find comfort and familiarity in knitting and maybe some release as well. and I get the break from knitting - after all, it must remind you on some level of all the hard times. But, there is also comfort in the rhythm of the knitting needles and the familiar sensual experiences - what you see, what you feel, the connection to the person for whom you are knitting (including yourself). Perhaps it is part of the healing that needs to happen?